A dreary Tuesday morning seems as good a time as any to plot ones weekly show schedule, I think. Let's take a look at what's happening in the greater DC metro this coming week, shall we? Hot diggity! Happy December to one and all...I'm sure many of you are with me on counting down the days left in this dumpster fire of a year. But now, let's take a peek at the musical happenings happening in greater DC this week. I'll be heading out of town for a few days, which means no shows for me. But there's a lot to keep you occupied this week. Get out there and see some live music! 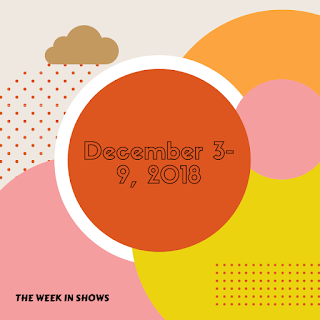 Without further ado, here's a look at some of the shows I happen to recommend for the coming week in the greater DC metro area. Bonus: catch yours truly at any show with an asterisk next to it.